I have loads of food photos and my new 2013 recipe journal has almost reached a fourth of the total pages but I’m slow as a snail in writing them up to my blog. Seriously, work (and laziness!) is getting in the way of blogging. 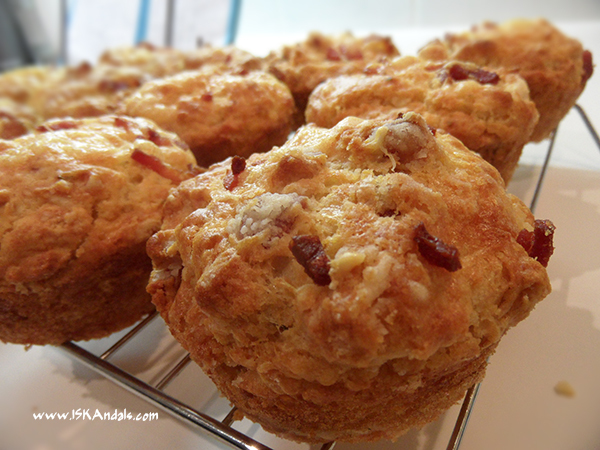 Just to get some up and going, here’s savoury bacon and cheese muffins. Recipe adapted from here and became one of my favorites to prep for the boys’ packed school snacks. Crispy on the outside, fluffy inside. YUM. 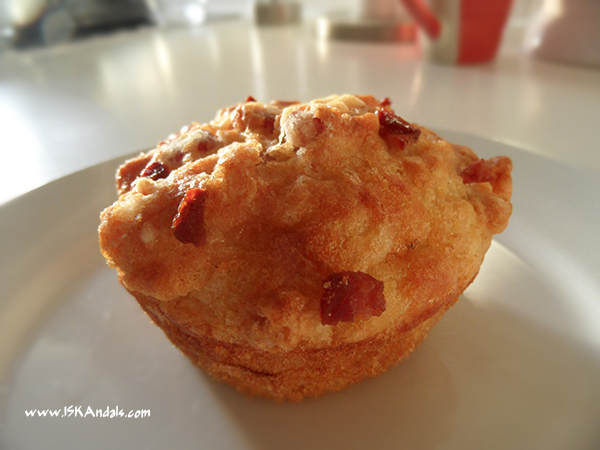 Cook chopped bacon in a microwave for about 3 minutes (depending on your microwave settings), or panfry until crisp. Dry on paper towels and set aside. Lightly grease 12-muffin tray. Set aside. Grate cheese to fill 1 cup. Set aside. 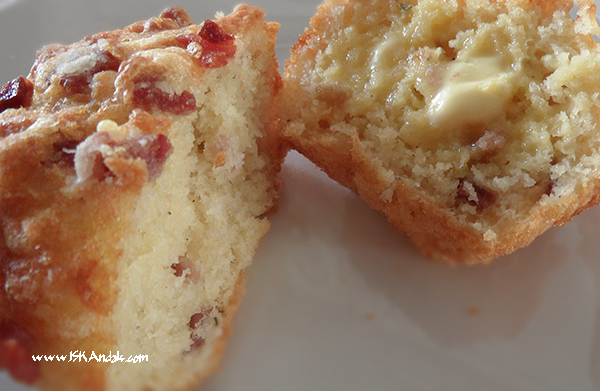 In a bowl, combine flour, baking powder, salt, freshly ground pepper and sugar. In a separate bowl, combine beaten egg, milk, oil and mustard. Set aside. 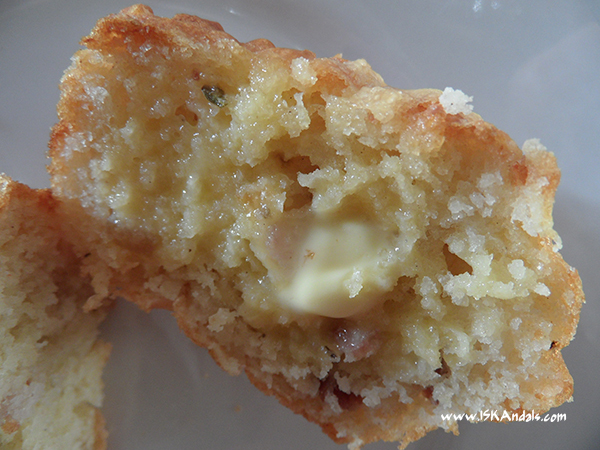 Add cheese, cooked bacon and thyme to the flour mixture. Make a hole at the center and pour the wet mixture in it. Mix no more than 10 seconds. 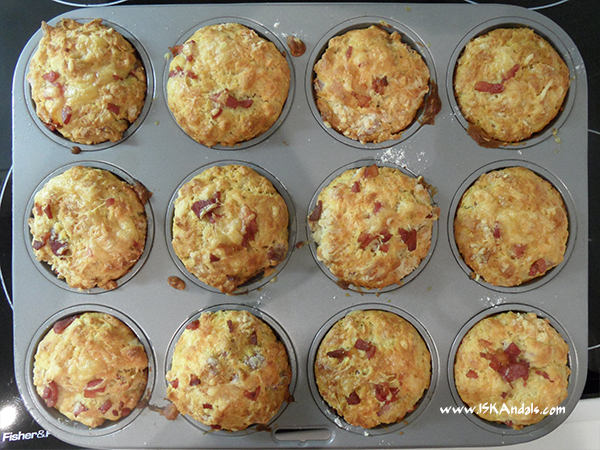 Scoop into muffin tray and top with extra grated cheese and bacon bits. Bake for 20 minutes. Transfer to a rack to cool for few minutes. Serve sliced and slapped with butter. ohmygosh! i just know that my boy and I are going to LOVE this! …so sorry for the very late visit….